In this tutorial we will show you how to install and configuration Icinga 2 on Debian 8 Jessie server. For those of you who didn’t know, Icinga 2 is an open source network monitoring system which checks the availability of your network resources, notifies users of outages, and generates performance data for reporting. Its Scalable and extensible, Icinga2 can monitor large, complex environments across multiple locations. This article assumes you have at least basic knowledge of linux, know how to use the shell, and most importantly, you host your site on your own VPS. The installation is quite simple and assumes you are running in the root account, if not you may need to add ‘sudo’ to the commands to get root privileges. I will show you through the step by step installation Icinga 2 network monitoring on a Debian 8 (Jessie) server. Ability to define network host hierarchy using “parent” hosts, allowing detection of and distinction between hosts that are down and those that are unreachable. Ability to define event handlers to be run during service or host events for proactive problem resolution. Notification of contact persons when service or host problems occur and get resolved (via email, pager, or user-defined method). Escalation of alerts to other users or communication channels. Performance graphing via add-ons such as PNP4Nagios, NagiosGrapher and InGraph. A Debian 8 LAMP server is required. If you do not have LAMP installed, you can follow our guide here. Step 3. Installing Icinga 2. Step 4. Installing Icinga2 plugin. Step 5. Configuring MariaDB for Icinga 2. Step 6. Installing Icinga 2 Web. Step 7. Accessing Icinga 2. Icinga2 will be available on HTTP port 80 by default. Open your favorite browser and navigate to http://yourdomain.com/icingaweb2/setup or http://server-ip/icingaweb2/setup and complete the required the steps to finish the installation. If you are using a firewall, please open port 80 to enable access to the control panel. Congratulation’s! You have successfully installed Icinga. Thanks for using this tutorial for installing Icinga 2 network monitoring on Debian 8 Jessie server. 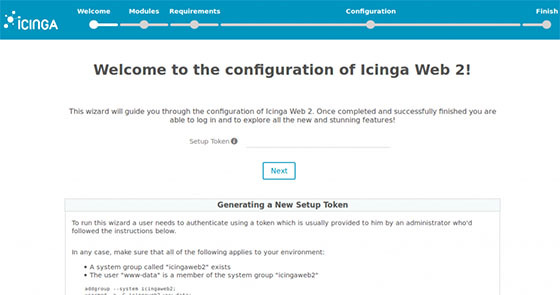 For additional help or useful information, we recommend you to check the official Icinga web site. Related Posts of "How To Install Icinga 2 on Debian 8"